If you're all about relaxed dressing when it comes to fashion, you'll love this absolutely chic pairing of a black leather biker jacket and a Bering ceramic watch. Amp up the cool of your getup by completing it with black leather loafers. 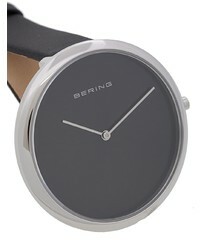 The versatility of a black coat and a Bering ceramic watch makes them investment-worthy pieces. Amp up the cool of your look by finishing off with black suede loafers. If you're a fan of relaxed dressing when it comes to your personal style, you'll love this uber cute pairing of a black quilted leather biker jacket and a black leather watch. Amp up the cool of your outfit by complementing it with black leather pumps. If you're all about practicality dressing when it comes to your personal style, you'll love this extra adorable pairing of a tan double breasted blazer and a black leather watch. Kick up the cool of your getup by finishing off with black leather tassel loafers. 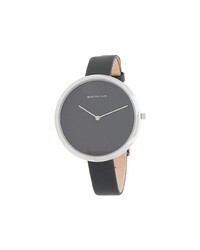 Marry a grey knit turtleneck with a Bering ceramic watch from farfetch.com, if you want to dress for comfort without looking like a slob. Kick up the cool of your ensemble by rounding it off with burgundy leather loafers. If you're a fan of functionality dressing when it comes to your personal style, you'll love this totally stylish combo of a charcoal sleeveless turtleneck and a Bering ceramic watch. Up the ante of your outfit with black leather pumps. If you're all about feeling relaxed when it comes to dressing up, this combination of a black lace tank and a Bering ceramic watch is totally you. A pair of black suede gladiator sandals adds some real flair to this getup. If you're obsessed with relaxed dressing when it comes to fashion, you'll love this uber cute pairing of a white sleeveless top and a Bering ceramic watch. Spruce up this outfit with black leather pumps. If you're a fan of relaxed dressing when it comes to fashion, you'll love this uber cute combo of a white shift dress and a Bering ceramic watch. Complement this getup with tan leopard suede slip-on sneakers.